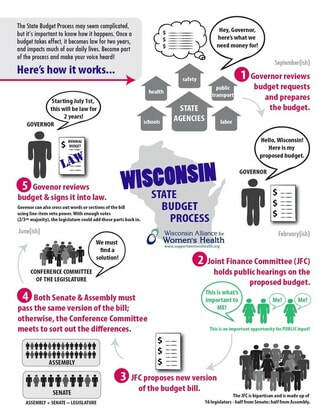 ​Wisconsin State Budget ProcessWondering how it all works? ​BadgerCare is Wisconsin’s form of Medicaid and currently covers low-income adults with an income of up to 100 percent of the Federal Poverty Level. However, there are thousands of Wisconsin families above the 100 percent of the Federal Poverty Level that earn too much to qualify for BadgerCare, but not enough to afford private insurance. They are forced to make the unacceptable decision between meeting their family’s basic needs (food, housing, utilities) and paying for healthcare. People in this affordability gap are dependent upon unreliable patchwork programs or are uninsured. As originally passed, the Affordable Care Act (ACA) required all state Medicaid (known as BadgerCare in Wisconsin) programs to provide health insurance coverage to all adults under age 65 who live in a household with income up to 138% of the federal poverty level. In order to help states afford Medicaid eligibility expansion, the ACA also provides federal matching funds for any newly eligible groups of people who did not previously qualify for a state Medicaid program. The 2012 Supreme Court case NFIB v. Sebelius made Medicaid expansion optional for states. To date, 37 states have fully expanded their Medicaid program; Wisconsin is not one of them. Following the Sebelius Supreme Court Case, former Governor Walker and the Republican-led Legislature elected to reject federal funds available under the Affordable Care Act (ACA) that would have expanded BadgerCare to 138 percent of the federal poverty level. This action left thousands of Wisconsinites uninsured and unable to afford health coverage. Governor Evers budget would allow Wisconsin to accept federal funds to expand BadgerCare eligibility to those earning up to 138 percent of the federal poverty level. This would enable an additional 83,000 Wisconsinites to receive health care insurance under the program and is estimated to save Wisconsin approximately $834 million over the next 6 years. BadgerCare expansion in Wisconsin would have a significant impact on the healthcare of women and children. This is an issue that disproportionately impacts women since the majority of medicaid eligible individuals are women. Women are also the primary utilizers of family planning and maternal health care benefits under BadgerCare. Low-income, uninsured women are more likely to forego health care because of cost, are less likely to have a regular source of care, and utilize preventive services at lower rates than low-income women with health insurance. Low-income women without access to BadgerCare coverage often have to rely on a patchwork of care programs in order to receive the basic health care they need. States that have expanded Medicaid under the ACA have reduced racial disparities in their uninsured rates, which is important for Wisconsin given our state’s racial health care disparities. Wisconsin has the highest African American infant mortality rate in the United States. The rate of infant deaths for black babies in Wisconsin is nearly three times as high as white babies. Expanding BadgerCare to provide coverage to more women and babies is necessary to address our infant mortality crisis. WAWH strongly supports Wisconsin expanding BadgerCare, as offered under the ACA, to cover all adults who earn up to 138% of the Federal Poverty Level. Full expansion, as Governor Evers’ budget includes, would make BadgerCare available to many women in Wisconsin and help reduce Wisconsin’s affordability gap.